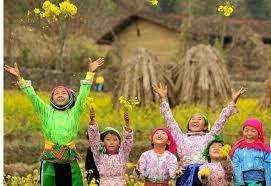 Arrive in Lao Cai around 5:30 a.m. We will take 1 hour van ride uphill to the beautiful town of Sapa. 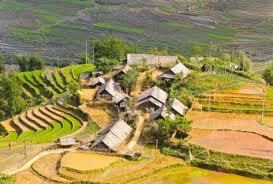 The ride gives you a glimpse of the stunning vistas and impressive rice terraces. Upon arrival Sapa town, we have buffet breakfast at the hotel and then we have a short walk of 5km along mountain trail to visit Y Linh Ho village which is inhabited by black Hmong tribe and completely secluded from tourists, especially you are able to embrace raw Sapa culture and community by coming into some native houses to discover their own culture and custom as well as study how the local tribe make handicraft from natural materials such as: hemp, indigo…ect. Continuing to walk down Muong Hoa River where you can take a rest or swim before trekking uphill to Lao Chai village where your picnic lunch will be served. After lunch, you will visit the Day and Red Dzao tribes of Tavan village, which lies in the middle of Muong Hoa valley where excellent panoramas of rice terraced fields. There you will have a cooking class, dinner and stay over night at local house. You have breakfast at the home stay before trekking about 8km towards the Red Dzao village of Giang Ta Chai. On the way you will trek up and downhill then through bamboo forest before arriving at the waterfall, Rattan bridge and Stream where you have short rest to swim and picnic lunch. Continuing to walk uphill about 2km to Hau Thao village where we catch the car to return to Sapa. You are free to discover Sapa town and Market before having shower and dinner then being transferred to Lao Cai train station to catch the night train to Hanoi. You will arrive in Hanoi at 05.00am. Tour finishes.